No vehicle in World of Tanks can operate without a complete virtual crew. The crew operates the vehicle under the direction of the player. The size of a complete crew varies, depending on the vehicle. In-game crews range from a minimum of 2 to a maximum of 6 crew members. Crew members fill one of five designated roles, or Major Qualifications within a vehicle. The 5 roles are Commander, Gunner, Driver, Radio Operator, and Loader. Just as vehicles accumulate experience for every battle, so do crew members. Each crew member has a Personal File, which records his/her battle statistics, medals,Training Level, qualifications, training levels in any Skills and/or Perks he/she has acquired. Credits or gold can also be used to immediately train a crew member up to 75% (using credits) or 100% (using gold) in their qualifications. Credits/gold cannot be used to boost the training of Skills and/or Perks. Each crew member's Proficiency directly affects and improves the performance of their vehicle in battle. If a crew member is knocked out in battle, the vehicle's performance will suffer, especially in the area affected by their role (As the remaining crew members take over temporarily). A knocked out Driver, for example, would reduce the acceleration, speed, and maneuverability of your vehicle. Since the Commander provides a bonus to the rest of the crew, losing the Commander will slightly degrade the performance of all remaining crew members. Skills/Perks belonging to a knocked out crew member are also disabled. If all crew members are knocked out, the vehicle will become inoperable. Each crew member fills one of five named roles within the vehicle. Each role performs a specific job. These five roles are referred to in-game as the "Major Qualification" of the crew member, and include: Commander, Gunner, Driver, Radio Operator, or Loader. During battle, each crew member's health is represented graphically in the battle interface by the following icons. The icon will change to indicate a crew member has been knocked out. For each crew member, his/her Training Level in their Major Qualification, and the levels of each and every Skill or Perk has acquired, all combine to constitute to overall "Proficiency". 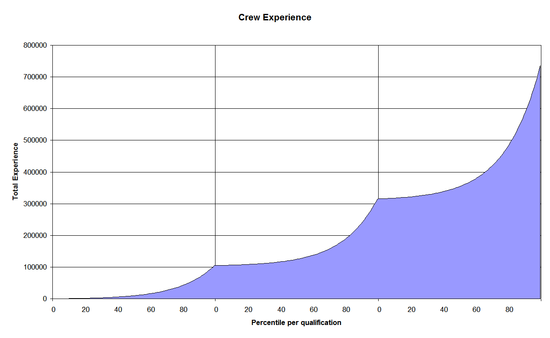 The degree of Proficiency of each individual crew member is important because the factors contributing to it are all used in the game mechanics calculations. A crew member's Proficiency directly affects and improves the properties of certain modules installed on the vehicle, the respective handling and performance characteristics of those modules, and the vehicle's overall performance in battle. The Proficiency of the crew members also impacts the speed at which damaged modules are repaired, and how much damage fires do and whether or not fires are extinguished before it's too late. Proficiency also affects the effectiveness of the vehicle's camouflage, serving to hide the vehicle from its enemies and avoid detection. The Commander's principal job is to spot enemy vehicles. The Commander's degree of Proficiency directly affects their View Range. The more Proficient the Commander the greater the distance at which an enemy can be Spotted. The Commander also gives a small bonus to all other crew members in the vehicle; 10% of the Commander's Major Qualification. The Gunner's principal job is to aim and fire the vehicle's main gun. The Gunner's degree of Proficiency directly affects the Aiming Speed at which the sights lock on to a target, the Accuracy of each shot, and the Turret Traverse (rotation) speed. The more Proficient the Gunner, the better the shots he/she will make. The Driver's principal job is to drive and maneuver the vehicle. The Driver's degree of Proficiency directly affects the Movement and Manueverability of the vehicle, including its acceleration, top speed, terrain resistance, and hull traverse speed. The more Proficient the Driver, the better the vehicle will maneuver. The Radio Operator's principal job is communicating with allies. The Radio Operator's degree of Proficiency directly affects the Radio or Signal Range of the vehicle. The vehicle can communicate with any allied vehicle whose Signal Range overlaps with its own. Any vehicles (friend or foe) which are spotted by any allied vehicle within Signal Range will also be communicated to and display on the player's mini-map. This provides battlefield situational awareness which can be a decisive tactical advantage. The more Proficient the Radio Operator, the greater the distance that the vehicle can communicate with allies and thereby spot enemy tanks. The Loader's principal job is loading the next round into the main gun. Each Loader's Proficiency directly affects how fast the next shell is loaded, and the more Proficient the Loader(s) the faster the gun reloads. The more Proficient the Loader, the faster the time to reload the gun. Some vehicles, particularly large caliber SPGs and TDs, may require a crew of 6 members and include a second Loader. The M2 Medium Tank requires a crew of 6, two of whom are Radio Operators. The T1 Heavy Tank and the M6 each carry crews of 6 with two gunners. On the plus side, if one of the two is knocked out, the tank will continue to perform that role at 50% of the crew's skill, rather than at 0%. It also allows for more skills and/or perks. Other vehicles may require a crew complement of only 2, 3, or 4 crew members, less than the five Major Qualifications. Small light tanks with a crew of only 2 usually include a Commander and a Driver. In such cases the game mechanics calculations require a crew member to perform additional roles. For example, in an MS-1, the Commander also fills the role of Gunner, Radio Operator, and Loader, while the Driver only drives. Although these crew members perform multiple roles, they still only have one Qualification, which is the first, or left-most, icon. In this example, if the Commander was knocked out in battle, the performance of all of the four roles he/she was filling would suffer. The Barracks is where players can find all their crew members, whether the crewman is assigned to a tank in the Garage or is a resident in the Barracks itself. On the left side of the Garage view screen players will see a list of the crew members that are assigned to the vehicle that is currently selected and displayed in the Garage. The Barracks view entry tab is located in the Garage view, top center-right. Players start with sixteen bunks in their Barracks, and can increase the number of bunks by additional increments of 16 bunks at a cost of 300 Gold by scrolling down and selecting the Enlarge Barracks button. Only crew members who are not assigned to a tank in the Garage actually take up a bunk in the Barracks. Those crew members who are currently assigned to vehicles in the Garage are listed in the Barracks window, but do not occupy a bunk in the Barracks. By using the toggles and drop-down menus on the left side of the Barracks window, a player can sort the crew members by their nationality, Vehicle Competence, Major Qualification, and location (whether assigned to a tank or not). In the Garage view, hovering the cursor over a crew member will provide information about that crewman. A left-click on a crew member will bring up a small pop-up menu which will allow replacement of the crew member with 1) a new Recruit or 2) with another crewman of same Major Qualification already resident in a bunk in the Barracks. A right-click on a crew member will bring up a small pop-up menu, which will allow players to 1) view the selected crew member's Personal File, 2) send him to the Barracks, or 3) send the entire crew to the Barracks. The crew member's Avatar image, their Rank, and their Full Name. their Major Qualification, meaning the role and job he/she is trained for. their Training Level in their Major Qualification expressed as a percent. Modifiers to their Major Qualification Training Level. their Vehicle Competence: The name of the vehicle in which he/she has a Major Qualification. their assigned Skills and Perks, and whether each is trained to 100% or, if not, the level so far achieved. Service Record: - displays information about the crew member's service record which includes the number of battles he/she has fought and awards he/she has received over the course of their career. Battles and awards stay with him, even if the crew member is retrained and transferred to another vehicle. This tab also shows the amount of experience and estimated battles needed to upgrade any Skills or Perks to 100%. Training: - displays information about either 1) increasing crew member's Training Level in their Major Qualification on their current vehicle or 2) retraining him for a different vehicle prior to a transfer to a different vehicle. See also: Retraining. Skills: - displays information about the Skills and Perks that are currently available for the selected crew member to learn. When a crewman is ready to start their training on a skill/perk, a button will appear which will allow the player to commence the crew member's training. See also: Skills and Perks. Personal Data: - displays the photo/avatar, first name, and last name of the crew member. From this screen, at a cost 50 Gold, players can change the names and avatar of each crew member by selecting from lists of pre-defined names and faces. New Recruits - A new crew member may be recruited at any time. New recruits are randomly generated by the game mechanics and arrive with a pre-set Major Qualification for a specific Vehicle Competence as chosen by the player. Moving an Experienced Crew Member to a Different Vehicle - A crew member may be moved from one vehicle to another as long as the move is to a role with the same Major Qualification he/she already has and new vehicle is of the same Nation as the one he/she is leaving. he/she will require retraining in the new vehicle as described in the following section. Dismissals - A crew member may be dismissed from service at any time. However, remember that dismissal is permanent and cannot be undone. All the dismissed crew member's accumulated experience, Training Level, and any Skills or Perks he/she has earned are also permanently lost. A crewman can be dismissed by right clicking on their icon in the Garage view and selecting dismiss. From the Barracks view, a crew member can be dismissed by clicking on the "Dismiss" button their icon. Tank Academy - At the cost of 200 Gold, the player's selection of the Tank Academy option will cause the new recruit to immediately obtain a 100% Training Level in their Major Qualification, and thereby automatically unlock and make available the further selection of a first Skill or Perk. Regimental School - At the cost of 20,000 credits, the player's selection of the Regimental School option will cause the new crew member to immediately obtain a 75% Training Level in their Major Qualification. In such case no Skill or Perk selection will become available until the crew member's Training Level in their Major Qualification reaches 100% through experience earned in battle. Rapid Courses - For free, the player's selection of the Rapid Courses option will cause the new recruit to obtain the default of a 50% Training Level in their Major Qualification. In such case no Skill or Perk selection will become available until the crew member's Training Level in their Major Qualification reaches 100% through experience earned in battle. Tank Academy - At the cost of 200 Gold, the player's selection of the Tank Academy option will cause the existing crew member to immediately obtain a 100% Training Level in their Major Qualification for the new vehicle. If the crew member has no existing Skills or Perks, then this option will automatically unlock and make available the further selection of a first Skill or Perk. If the crew member has already acquired any Skills or Perks, then each of them will carry over to the new vehicle and immediately become active without any reduction in the same percentage level earned prior to the move. Regimental School - At the cost of 20,000 credits, the player's selection of the Regimental School option will cause the existing crew member to immediately obtain a new Major Qualification Training Level equivalent to 75%, or to 90% of their former Training Level, whichever is greater; if he/she is retraining to a new vehicle of the same type. For example, moving from one TD to a different TD. If the move is from a vehicle of one type to another, a TD to SPG, then the Regimental School option retrains him to 75%, or 80% of their former level, whichever is greater. In either such case no new Skill or Perk selection will become available until the crew member's Training Level in their Major Qualification reaches 100% through experience earned in battle. Rapid Courses - For free, the player's selection of the Rapid Courses option will cause the existing crew memberuit to immediately obtain the default Major Qualification Training Level equivalent to 50%, or to 80% of their former Training Level, whichever is greater; if he/she is retraining to a new vehicle of the same type. For example, moving from one TD to a different TD. If the move is from a vehicle of one type to another, a TD to SPG, then the Regimental School option retrains him to 50%, or 60% of their former level, whichever is greater. In either such case no new Skill or Perk selection will become available until the crew member's Training Level in their Major Qualification reaches 100% through experience earned in battle. Effect on Pre-Existing Skills and Perks - If the crew member has already acquired any Skills or Perks prior to retraining by Rapid Courses or by Regimental School, then each of them will carry over to the new vehicle without any reduction in the same percentage level earned prior to the move. They will remain effective in the new vehicle at their current percentage levels. However, their icons will be greyed out and such Skills and Perks will not resume accumulating additional experience through battle and increasing in effectiveness until such time as the Training Level in the Major Qualification in the new vehicle reaches 100%. Thereafter, such Skills and Perks will all be restored to active, their icon will illuminate, and once again they will start accumulating additional experience through battle. Reasons to Re-Train and Transfer Crew Members After your grind is finished and you plan on selling your vehicle and purchasing the one in the next higher tier, it is almost always a good idea to send your crew from the sold vehicle to the Barracks prior to its sale, buy the new higher tier vehicle with "No Crew" option box checked, and then move the old crew to the new vehicle and retrain them for it. This is especially true if you have any Skills and Perks among the crew.It takes a lot of experienced gained in battles or a substantial amount of gold to train a crew to 100% in their Major Qualifications. It takes a lot more hard fought battle experience over a long period of time for a crewman to acquire 1, 2, or 3 Skills or Perks. You have a big investment in your crew member's training. That investment translates into improved performance on the battlefield of any vehicle the experienced crew member serves on. If a crew member has any accumulated Skills or Perks at all it is not a good idea to dismiss him, even if you have to buy additional bunks for the Barracks to keep him available for a future vehicle. A fresh recruit, even if with a 100% Training Level in their Major Qualification purchased with gold at the time of recruitment will start with their one new Skill or Perk at 0% level. Since Skills and Perks are retained through retraining, it is almost always a good idea to retrain crew members who have already obtained them. Even if your crew does not yet have any Skills or Perks it may make sense to retrain. For example, if your existing crew member has already reached more than 83% Training Level in their Major Qualification, retraining him to a vehicle of the same type in the Regimental School at 90% of their former level will leave him with a training level that is still higher than the 75% for a crew member recruited fresh out of Regimental School. You should avoid retraining between vehicle types or use gold which retrains to 100% regardless of the type. A crew member's rank and the medals he/she has earned are retained through retraining. Although neither have any affect on the crew member's performance, you may be interested to continue a crew member's career to further their rank and achievements. A crew member can only be trained in one Skill or Perk at a time. After the first Skill or Perk reaches 100%, the icon will reappear and a second Skill or Perk can be selected in the same manner. However, the amount of experience required to train an additional Skill or Perk doubles each time one is selected, making the acquisition of every available Skill and Perk an unrealistic goal for each crew member. See the section on Training Level for an explanation of how experience is applied to increase it. The tables below give more detail than the overview on the WoT Guide's How to use Perks and Skills page. Repair All The Repair Skill improves a crew member's ability to repair a module that has been damaged or knocked out. The Repair Skill effect is cumulative with that of any installed Toolbox equipment. The higher this Skill's Training Level the faster repairs are completed. The Repairs effect starts as soon as a module is damaged. The Repair Skill is a common Skill which each one of the crew members on a single vehicle may acquire. The effective Repairs Skill Training Level is averaged across the entire crew. If only one crewman in a crew of 4 has this Skill at 80% Training Level then the effectiveness upon the vehicle's Repairs performance is (80+0+0+0)/4 or 20%. 100% of repair skill on all crew members probably increases repair speed for about 50% (detailed information is not provided). Firefighting All The Firefighting Skill improves the crew member's ability to put out a fire, should a vehicle ever be unlucky enough to be in such a situation. The Firefighting Skill takes effect immediately when the vehicle catches fire. The higher the Training Level for this Skill, the faster a fire is put out and the less the amount of damage per second the fire does to the vehicle before it is extinguished. The Firefighting Skill does NOT reduce the chances of a vehicle catching on fire in the first place. The Firefighting Skill is a common Skill which each one of the crew members on a single vehicle may acquire. The effective Firefighting Skill Training Level is averaged across the entire crew. If only one crewman in a crew of 4 has this Skill at 80% Training Level then the effectiveness upon the vehicle's fire fighting performance is (80+0+0+0)/4 or 20%. Firefighting Skills are more useful for large vehicles that can stand to take some damage before being utterly destroyed, but purchasing the player controlled and consumable Manual or Automatic Fire Extinguisher is generally more effective in preventing fire from spreading to other modules or destroying the vehicle. Concealment All The Concealment Skill improves the crew member's ability to help increase the vehicle's Camouflage capability and hide the vehicle from enemies. A higher Training Level lowers the chances that the vehicle will be spotted by the enemy, requiring enemies to be closer in order to detect your vehicle. The Concealment Skill effect is cumulative with that of any installed Camouflage Net equipment. The Concealment Skill is a common Skill which each one of the crew members on a single vehicle may acquire. The effective Concealment Skill Training Level is averaged across the entire crew. If only one crewman in a crew of 4 has this Skill at 80% Training Level then the effectiveness upon the vehicle's Camouflage performance is (80+0+0+0)/4 or 20%. Jack of All Trades Commander The Jack of All Trades Skill enables the Commander to fill in for and perform the role of any wounded or killed crew members. The replacement starts immediately upon injury or death of a crew member, but is limited to the Skill's current Training Level x 0.5% (Or up to a maximum of 50%) for the first knocked out crew member. If additional crew members are knocked out then the effect is divided evenly between the additional knocked out crew members. If the Commander is replacing one knocked out crewman then the Commander performs that role at 50% level, if he/she must replace 2 knocked out crewman at the same time, the Commander performs each of the two roles at 25%. The Jack of All Trades Skill is useful for large vehicles that can be expected to take a lot of damage dangerous to the crew, but purchasing the player controlled and consumable Large or Small First Aid Kit is generally more effective. The Snap Shot Skill is primarily helpful on fast tanks that like to circle or flank, but also useful for peek-a-boo shooting. To be clear, the Snap Shot Skill improves the accuracy of shots made while the "turret" is moving and the Smooth Ride Skill affects same when the "vehicle"'s hull is moving. Both Snap Shot and Smooth Ride Skills are recommended for best performance, particularly for medium tanks or for any player who likes to run and gun and fire on the move. The Smooth Ride Skill is primarily helpful on fast tanks that like to circle or flank, but also useful for peek-a-boo shooting. To be clear, the Smooth Ride Skill improves the accuracy of shots made while the "vehicle" is moving and the Snap Shot Skill affects the same when the "turret" is moving. Both Snap Shot and Smooth Ride Skills are recommended for best battle performance, particularly for medium tanks or for any player who likes to run and gun and fire on the move. Brothers in Arms All The Brothers in Arms (aka "BIA") Perk increases by a fixed 5%, the Training Level of each one of the crew members in their Major Qualification and in any of the common Skills (Repair, Firefighting, and/or Camouflage) they may have acquired. It also improves the Commander's Mentor Skill by 5%. The BIA Perk does not have any effect on other role-specific Skills or Perks, and provides no benefit whatsoever unless all of the crew have it trained to 100%. It does stay in effect if a crew member is knocked out during battle. The effect of the BIA Perk is cumulative with that of any installed Improved Ventilation equipment and with any purchased crew Skills boosting consumables such as Extra Combat Rations, Case of Cola, Chocolate, Pudding and Tea, Strong Coffee, and/or Improved Combat Rations. Sisterhood of Steel was combined with Brothers in Arms in Update 9.19. Deadeye Gunner The Deadeye Perk enables the Gunner to increase, by a fixed amount of 3%, the chance that a shot will critically damage enemy vehicle modules and crew with AP, APCR, or HEAT shells. It does not work with HE/HESH shells. If two Gunners on the vehicle have the Perk, the effect is not cumulative. Call for Vengeance Radio Operator The Call for Vengeance Perk enables the Radio Operator to continue to report enemy positions for an additional two seconds after the destruction of their own vehicle. If two Radio Operators on the vehicle have the Perk, the effect is not cumulative. Safe Stowage Loader The Safe Stowage Perk enables a Loader to stow rounds in the storage racks in such a way that they do not come into contact with each other. The result is simulated as an increase in ammo rack durability of 12.5%. If two Loaders have the Perk, the effect is not cumulative. The effect of the Safe Stowage Perk is cumulative with that of increased ammo rack durability that comes with any installed Wet Ammo Rack equipment. Intuition Loader The Intuition Perk creates a 17% chance that the Loader will instantly switch the shell type to the type you choose. This switch will not reset the reload timer, and if the shell was already loaded, it will remain so. The effect of this Perk is cumulative, so if a vehicle has two Loaders and both Loaders have this Perk then the chance for a switch will increase by 34%. The Perk only works if more than one ammo shell type is on-board and available. After the Perk takes effect, the gun must be completely reloaded before it can take effect again. Delaying Selection of a Skill or Perk If you do not chose a Skill or a Perk immediately after it becomes available, that crew member will nevertheless continue to gather experience and will apply stored experience to the proper Skill once a Skill is chosen. This is beneficial when purchasing a new tank with 100% crew, but not knowing what Skills or Perks would benefit it. You can play some battles with that crew before selecting their Skills or Perks. It can also be useful during retraining. If a crew member's Training Level percentage for their role drops due to retraining, all new experience earned will be applied to restoring the Training Level in their Major Qualification until it reaches 100% again. However, any acquired Skills or Perks will not drop and will remain in effect. Effect of Secondary Roles on a Skill or Perk Some vehicles require crew members to assume secondary roles in addition to that of their Major Qualification. In a vehicle requiring a crew of only two, a Commander and a Driver, the Commander also fills the secondary roles of Gunner, Radio Operator, and Loader. In such case, any Skills and Perks that would otherwise be available only to the Gunner, Radio Operator, or Loader are available to the Commander. If the Commander is moved to another vehicle where he/she no longer fills a secondary role then any Skill or Perk he/she had specifically for the secondary role becomes inactive. For example, the Leichttraktor has a crew of three and the Commander assumes the secondary roles and acts also as the vehicle's Radio Operator and Gunner. You have trained him with a Skill available only to a Radio Operator and a Perk available only to a Gunner. If you then move that Commander to the Pz.Kpfw. II which has a crew of three, your Commander loses the role of Radio Operator and the Skill associated with it. However, he/she retains their Perk as Gunner because he/she has that secondary role in the new vehicle. The Radio Operator Skill is not lost, merely inactive when the Commander is placed in a vehicle with another member of the Crew in the role of Radio Operator. If the Commander is later moved back to the Leichttraktor, the Skill will be restored at its previous level. If done for free, it results in the loss of 20% of the crewman's total Skill/Perk experience points. If done for credits, it results in the loss of 10% of the crewman's total Skill/Perk experience points. For 200 Gold, it results in no loss of experience. Since the first two options are based on total Skill/Perk experience points, the more Skills/Perks a crewman has, the more expensive (in terms of experience points) they become. However, these options only reduce a crewman's Skill/Perk experience points, and don't take their role experience points into consideration. For example, if you have a crewman who just reached 100% in their Major Qualification, and you choose a Skill (which has 0% Training Level), and then immediately decide to change it, then choosing the free option won't actually cost you any experience. Since each additional percentage point requires more experience than the one before, you can't simply take 10/20% off of the displayed Training Level percentage. Instead you have to determine the crewman's Skill/Perk experience points (calculated from the chart below), and take 10/20% off of that. Then you can use the number of Skill/Perk experience points remaining to determine what the Skill/Perk's Training Level will be after the reduction. For example, if you have a crewman with a 50% Training Level in their first Skill/Perk, and drop their Skill/Perk with the free option (a 20% reduction), you don't take 20% off of 50%. If you did, you'd get 40%, which would be wrong. You actually get 45%. It takes 19,097 experience points to reach a 50% Training Level. Reduce that by 20% and you have 15,227 experience points remaining. 15,227 experience points are enough for a 45% Training Level. Likewise a crewman with 100% in their first Skill/Perk and 80% Training Level in their second Skill/Perk (which comes to 374,765 experience points) will end up at 100% and 67% with the 298,662 experience points remaining, not 100% and 44%. Given the high cost (in experience, credits, or gold) it's clearly in your best interest to choose Skills and Perks carefully in the first place. If retraining a crew member from another vehicle resulted in their Training Level dropping below 100% for their role, then subsequently resetting their Skills and Perks will automatically assign all free experience to the Major Qualification Training Level until it reaches 100% again. Any experience left over can then be reassigned to Skills or Perks of your choice. The Training Level for each crew member is progressively increased by gaining Experience Points or XP earned in battle. Each crew member earns the same amount of XP from each battle that their vehicle does, plus or minus any applicable Bonuses and Penalties. The XP earned in battle is applied first to the Training Level of the crew member in their Major Qualification until it reaches 100%. Next all of the XP is applied to the Training Level of the 1st Skill or Perk until it reaches 100% and then XP is applied to the 2nd Skill or Perk and so on. Rapid Courses - To increase the Training Level of any crew member in their Major Qualification from the 50% level originally acquired through training or retraining with the Rapid Courses option to the full 100%, the crewman must acquire an additional total amount of 95,484 XP. Rapid Courses are the default starting point for any crew member's training or retraining and fix the starting point Training Level at 50%. The 9,758 XP otherwise required to increase the Training Level from 0% to 50% are therefore free. Regimental School - To increase the Training Level of any crew member in their Major Qualification from the 75% level originally acquired through training or retraining with the Regimental School option to the full 100%, the crewman must acquire an additional total amount of 72,543 XP. Regimental School training or retraining will fix the starting point Training Level at 75%. The 22,940 XP otherwise required to increase a crew member's Training Level from 50% to 75% may be purchased at a cost of 20,000 credits. From time to time Wargaming holds specials and promotional events which include discounting the cost of Regimental School by 50% to 10,000 credits. Tank Academy - To increase the Training Level of any crew member to the full 100% in their Major Qualification through training or retraining by the Tank Academy option does not require earning any additional XP. Tank Academy training or retraining will fix the starting point Training Level at 100%. The 95,484 XP otherwise required to increase a crew member's Training Level from 50% to 100% may be purchased at a cost of 200 gold. From time to time Wargaming holds specials and promotional events which include discounting the cost of Tank Academy by 50% to 100 gold. It is important to recognize two facts about the amount of XP required to increase Training Level. Major Qualification from 0% to 100% requires a total of 105,030 XP. 1st Skill or Perk from 0% to 100% requires a total of 210,060 XP. 2nd Skill or Perk from 0% to 100% requires a total of 420,120 XP. 3rd Skill or Perk from 0% to 100% requires a total of 840,240 XP. Major Qualification by 1% from 68% to 69% requires 21 × 25 × 100(68/100) = 1,146 XP, but to increase it the 1% from 98% to 99% will require 21 × 25 × 100(98/100) = 4,560 XP. 1st Skill or Perk by 1% from 48% to 49% requires 22 × 25 × 100(48/100) = 912 XP, but to increase it the 1% from 98% to 99% will require 22 × 25 × 100(98/100) = 9,120 XP. 2nd Skill or Perk by 1% from 48% to 49% requires 23 × 25 × 100(48/100) = 1,824 XP, but to increase it the 1% from 98% to 99% will require 23 × 25 × 100(98/100) = 18,240 XP. 3rd Skill or Perk by 1% from 48% to 49% requires 24 × 25 × 100(48/100) = 3,648 XP, but to increase it the 1% from 98% to 99% will require 24 × 25 × 100(98/100) = 36,480 XP. If you wish, you can download an Excel calculator to help you visualize the implications of the formula and make your own calculations. The link can be found in the WoT Community Portal or here at WoT Training Level Calculator. The following graphs illustrate the progression of Training Level as it relates to the amount of experience required. 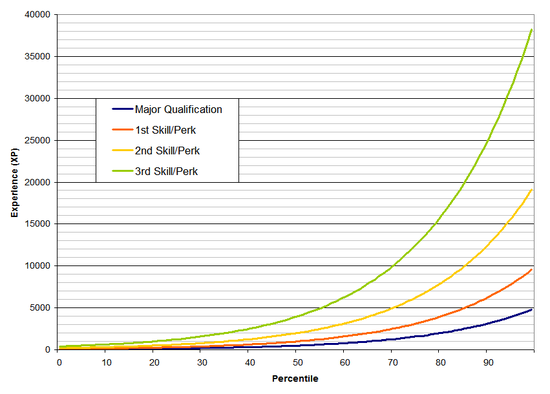 Graph detailing the amount of experience required to increase the Training Level of the Major Qualification and that of the first 3 Skills or Perks from 0% to 100%. Graph detailing cumulative amount of experience required to increase the Training Level of the Major Qualification and that of the first 2 Skills or Perks from 0% to 100%. The game mechanics include a system of Bonuses and Penalties that have variable effect upon the Training Level of the Major Qualification and that of any acquired Skill or Perk. Bonuses and Penalties also effect the applicability, effectiveness, and performance of some Skills and Perks and the amount of experience earned in a battle that is applied to increasing the Skill or Perk's Training Level. Bonuses and Penalties may change at any time during a battle depending upon the battlefield situation, the equipment installed on the vehicle, the consumables available on-board, the types of acquired Skills and Perks of the crew, the Training Levels of each crew member, and/or some combination of all of these factors. At the start of each battle those applicable Bonuses and Penalties have an impact on the Training Level of each crew member in their Major Qualification and that in each of their acquired Skills and Perks. The cumulative effect of these Bonuses and Penalties results in an overall Effective Training Level (See that section below) for the vehicle which includes Bonus additions and Penalty reductions used by the game mechanics to calculate your vehicle's performance in battle. The calculations are dynamic and change as Bonuses and Penalties change throughout the battle. At the conclusion of the battle, the net effect of all of the Bonuses and Penalties applied during the game will have an effect upon the amount of experience earned in the battle by the vehicle and by each crew member. The following Bonuses increase the Effective Training Level of your crew members and may also increase the amount of experience they earn in a battle. Buchty is only available for Czechoslovakian vehicles. Coffee with Cinnamon Buns is only available for Swedish vehicles. The Improved Ventilation Equipment Bonus: If at the start of a battle the vehicle is equipped with any purchased and installed Improved Ventilation equipment it will provide a flat 5% addition to the Training Level of the Major Qualification and to that of any acquired Skills for each crew member. There is no Bonus effect on Perks. The Bonus addition is effective for the entire battle and will remain effectgive for so long as the equipment is installed on the vehicle. The Bonus effect applies even if the Major Qualification or Skill Training Level is at 100%, ie 100+5=105%. Commander's Mentor Skill Bonus: If the vehicle's Commander has acquired the Mentor Skill, for every 1% of the Training Level of the Commander's Mentor Skill, all crew members except the Commander himself, receive an amount of 0.1% additional experience at the end of every battle, up to a maximum of 10% each when the Mentor Skill reaches 100%. If the Commander's Mentor Skill Training Level increases during the battle, the crew will benefit from the increase. Commander's Jack of All Trades Skill Bonus: If the vehicle's Commander has acquired the Jack of All Trades Skill, it enables the Commander to fill in for and perform the role of any wounded or killed crew members. The replacement starts immediately upon injury or death of a crew member, but is limited to the JoAT Skill's current Training Level x 0.5% (Or up to a maximum of 50%) for the first knocked out crew member. If additional crew members are knocked out then the effect is divided evenly between the additional knocked out crew members. If the Commander is replacing one knocked out crewman then the Commander performs that role at 50% level, if he/she must replace 2 knocked out crewman at the same time, the Commander performs each of the two roles at 25%. The JoAT Skill does not provide a direct Bonus for any knocked-out crewman but it does partially offset the Penalty that the vehicle's performance and experience earned in battle that would otherwise incur as a result of a dead crew member. It effectively adds to the experience the Commander may realize in the battle. The Brothers in Arms Perk Bonus: If each member of the crew has trained the BIA Perk to 100% Training Level then the Perk is active and it increases by a fixed amount of 5%, the Training Level of each one of the crew members in their Major Qualification and in any of the common Skills (Repair, Firefighting, and/or Camouflage) they may have acquired. It also improves the Commander's Mentor Skill by 5%. The BIA Perk does not have any affect on other other role-specific Skills or Perks a crewman may have. The Large First Aid Kit Bonus: If the vehicle is equipped with a purchased premium consumable Large First Aid Kit at the start of a battle it will provide a 15% reduction in the chance of each crew member suffering an injury from penetrating hits. Additionally, activating the LFAK will restore all injured or killed crew members to full health. However, the LFAK can only be activated one time per battle. Once activated it is consumed and the 15% reduction to crew injury risk is lost. The LFAK does not provide a direct Bonus to any crewman but while active it does reduce the risk of any crew member incurring a Penalty to the experience he/she would otherwise earn in the battle due to their being knocked-out. The Small First Aid Kit Bonus: If the vehicle is equipped with a purchased regular consumable Small First Aid Kit at the start of a battle it will provide the one-time ability to restore one injured or killed crew member to full health. The SFAK does not provide any Bonus to any crewman. The Daily Double Bonus: Each day at midnight server time, the daily double bonus resets and the first victory in each vehicle in the garage will be rewarded with x2 or double experience for the vehicle and for increasing the Training Level of each crew member. An icon in the form of a star followed by x2 appears in the upper right hand corner of the vehicle's imate in the carousel while in the garage. The icon disappears once the day's first victory has been won. From time to time, Wargaming holds a special event or promotion when the x2 for the first victory of the day is increased to x3 or even x5. Extra Crew Experience Bonus: From time to time, Wargaming holds a special event or promotion when the amount of experience applied to increasing crew Training Level is increased to x2 or even x3 from each battle during a fixed time period, usually a 3 day weekend. News of these special events is broadcast in advance on the portal. Accelerated Crew Training Bonus Option: For Premium/Award Vehicles and for fully researched Elite Status vehicles, the Player has the option of checking the Accelerate Crew Training box that appears above the crew panel in the garage. An icon appears in the crew panel to the left of the crew member who is receiving this experience, which is always the crew member with the least XP. This least trained crew member receives as their bonus the XP that would normally be accrued by the vehicle which is then multiplied by any Premium tank crew training bonus, Reserves, Dailies, etc. This means effectively, he/she will get twice the XP of other crew members. If a crew member is not competent to operate the tank he/she is placed in, or if a crew member gets injured during battle, then there is a Penalty to the Training Level of their Major Qualification and all Skills and Perks that will affect vehicle performance. There is also a Penalty that may apply to the amount of experience the crew member earns towards increasing their Training Level for that particular battle. Penalties are always applied before Bonuses in game mechanics calculations. If a crew member is moved to a vehicle of the same Type as that in which he/she has their Vehicle Competence, and the vehicle is a premium vehicle, there is no penalty. If a crew member is in a vehicle of the same Type as that in which he/she has their Vehicle Competence, and the vehicle is not a premium vehicle, he/she will take a 25% penalty to their current Training Level. For example, an 80% Training Level will be reduced by 25% to 60% and a 100% level would be reduced to 75%. If a crew member is in a vehicle of a different Type as that in which he/she has their Vehicle Competence, and the vehicle is a premium vehicle, he/she would also take a 25% Penalty to their current Training Level. If a crew member is in a vehicle of a different Type as that in which he/she has their Vehicle Competence, and the vehicle is not a premium vehicle, he/she will take a 50% penalty to their current Training Level. For example, an 80% Training Level will be reduced by 50% to 40%, while a 100% level would be reduced to 50%. Vehicle Competence Penalty on Experience to Increase Training Level: A tanker crewing a vehicle that he/she is has no Vehicle Competence in will earn less experience from each battle to be applied to increasing their Training Level. In a new vehicle of the same Type as that in which he/she has their Vehicle Competence, there is no Penalty if the new vehicle is a premium vehicle. In a vehicle of a different Type as that in which he/she has their Vehicle Competence, the crew member would earn 50% less experience per battle if the new vehicle is a premium vehicle. In a new non-premium vehicle of the same Type as that in which he/she has their Vehicle Competence, a Penalty will apply and the crewman would earn 50% less experience per battle than he/she normally would. In a new non-premium vehicle of a different Type as that in which he/she has their Vehicle Competence, a Penalty will apply and the crewman would earn 75% less experience per battle than he/she normally would. Injury or Death Penalty: A crew member who remains injured or is dead at the end of a battle is Penalized and will receive 10% less experience towards increasing their Training Level than he/she would have otherwise received. Using a Small First Aid Kit or Large First Aid Kit to heal a crew member will avoid this Penalty, unless they are injured again before the end of battle. Since the rate of crew injuries may not be the same across all the crew members, it is normal that each crew member will improve their Training Level at different rates than another tanker in the same crew should he/she be knocked out more or less often than their colleague. Commander knockout reduces the vehicle's view range. Gunner knockout reduces aiming speed and increases dispersion. Turret traverse speed will also decrease. If the gun was in the process of zeroing in on target at the moment of the Gunner's death, the process might start over. Driver knockout reduces the top speed, traverse speed, and acceleration of the vehicle. Radio Operator knockout reduces radio range. Loader knockout decreases reloading speed. If a shell was being loaded at the moment of the Loader's death, the process might start over. The Training Level for a crew member's Major Qualification and their Skills and Perks can be found by hovering the cursor over a crew member's icon in the crew panel in the garage. These Training Levels do not tell the whole story because they do not take into account any applicable Bonuses or Penalties that may be affecting the actual Training Level used in games mechanics calculations, the Effective Training Level. The Effective Training Level can be calculated using the Bonuses and Penalties that are known to be applied. The maximum Effective Training Level for their Major Qualification that can be achieved by a Commander is 120%. This is the sum of their 100% Training level + the 5% Bonus for installed Improved Ventilation equipment + the 10% Bonus if Premium Consumables are on-board + the 5% Bonus for Brothers in Arms Perk. If the Commander is serving on an open topped vehicle and Improved Ventilation equipment is not available to it then the Commander's maximum Effective Training Level will be 115%. The maximum Effective Training Level for their Major Qualification that can be achieved by any crew member other than the Commander is 132%. This is the sum of their 100% Training level + the 5% Bonus for installed Improved Ventilation equipment + the 10% Bonus if Premium Consumables are on-board + the 5% Bonus for Brothers in Arms Perk + the bonus of 10% of the Commander's Major Qualification level. If the crew member is serving on an open topped vehicle and Improved Ventilation equipment is not available to it then their maximum Effective Training Level will be 126.5%. Multiple Roles - Some vehicles in game have more than one Gunner, Loader, and Radio Operator on board in a normal crew complement. If more than one crew member in a vehicles have the same Major Qualification, then the average of their Training Levels is used to determine their joint performance in that role. For example, for a vehicle with two Loaders, one at 50% Training Level, and the other at 100%, their average Training Level of 75% will apply to the vehicle as the Loader's Effective Training Level in battle mechanics and vehicle performance calculations. Common Skills - The Effective Training Level of the Common Skills, (Repairs, Firefighting, and Camouflage) are averaged across all crew members. If more than one crew member in a vehicles have the same Common Skills, then the average of their Training Levels is used to determine their joint performance in the Common Skills. For example, for a vehicle with a crew of 4 and two of them are trained in Repairs, one to a level of 60% and one to a level of 100%, then the Effective Training Level for the Repairs Skill for the vehicle is (100+60+0+0)/4=40% and this value will apply in battle mechanics and vehicle perforance calculations. Role-Specific Skills and Perks - The Effective Training Level of the role-specific Skills and Perks is not averaged but affect the Effective Training Level directly. In a situation where multiple crewmen on the same vehicle both hold a role-specific Skill then the only one that will apply in battle mechanics and vehicle perforance calculations will be the one with the higher Skill Training Level. As your crew increases in training level, they will be awarded with higher ranks, with every 50% in a role, skill, or perk awarding a new rank. If, when retraining, a crew member loses some competence, he/she will not be demoted in rank. There are separate ranks for each nation. A crewman's rank also depends on their role. Loaders and Radio Operators start at the lowest rank and may only advance to the third-highest rank. Drivers and Gunners start out one rank higher and may advance to the second-highest rank. Commanders start out two ranks higher and may advance to the highest rank. This page was last modified on 10 January 2019, at 03:01. This page has been accessed 2,142,719 times.